Obsidian is a volcanic extrusive rock with a glassy texture that is very hard and dense. The volcanic glass is usually black in colour, but it can also be dark green and brown. In rare cases trace elements of mineral crystals can cause obsidian to reflect light in various colours, or even the colour spectrum of a rainbow. Obsidian forms where lava cools of too quickly for crystals to grow, for instance where lava comes in contact with water or on the edges of a lava flow. It can even take the form of small scatters or larger rocks. Characteristic for obsidian are extremely smooth surfaces, like glass, but in some cases impurities are present in the shape of so-called snowflakes (caused by crystallisation) or “bubbles”, which prevent the smooth fracture typical for the rock. 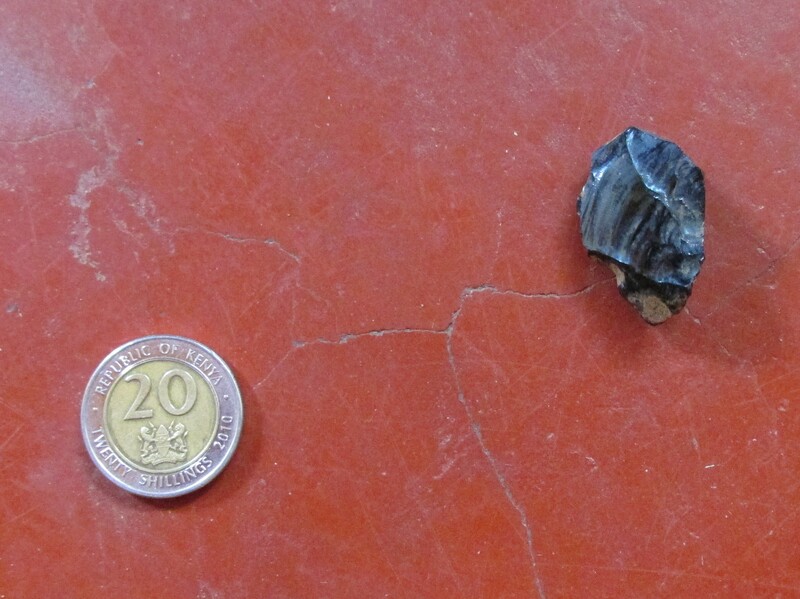 Obsidian was valued and often used for stone tool making. Similar to flint, the smooth glassy structure, the hardness and density of the rock allowed predictable and extremely precise knapping. The edge of a freshly broken obsidian rock is sharper than that of a surgical scalpel. The sharp edges and the extreme precision of knapping it allowed made obsidian a highly valuable object even after metalworking had been invented. 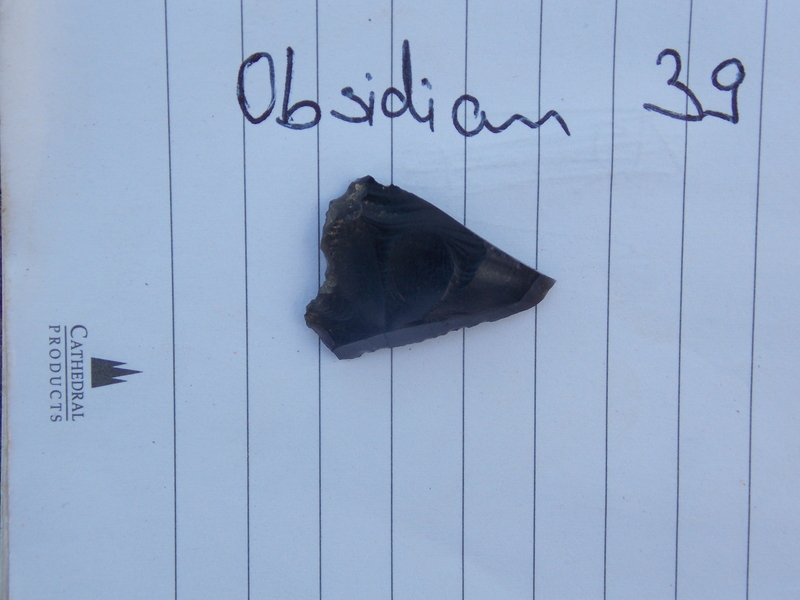 Obsidian was used to make arrowheads, bladelets, and microliths (tiny stone tools, sometimes shafted into wood to make handheld weapons and tools). Obsidian can be knapped so precisely that people were able to make knifes and daggers less than a centimeter thick, and it can be polished and used as a mirror. In East Africa, obsidian flakes and tools can be found back almost 2 million years, associated with the Acheulean stone tool industry. 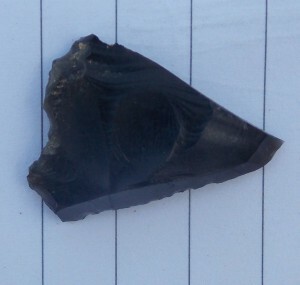 Obsidian stone tools are often found as surface scatters, indicating human presence in the landscape thousands of years ago, but they are also found in archaeological excavations and it continued to be used even in iron-working cultures because of its supreme blade. Hence, we cannot say that obsidian stone tools are only associated with Stone Age communities, and obsidian continues to be used today as a surgical tool. In some cases obsidian is polished and made into jewellery. Here is one of many flakes we had found scattered near Rongai in the Rift Valley.